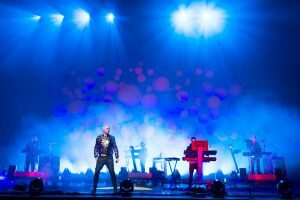 Although Neil Tennant  the Penn Jillette of the Pet Shop Boys  embraces the Eighties, he says the duo (whose other member is the mostly silent Chris Lowe) is moving musically forward, yet with more than a nod to the era that saw the hits ‘West End Girls’ and ‘Opportunities’ bring them instant international recognition. ‘This tour, we’re playing Eighties songs in the Eighties arrangements. On previous tours, we kind of reworked things, but this tour, we decided to treat the arrangements as classic arrangements,’ Tennant says. Having just opened a North American tour October 10 in Montreal, the Pet Shop Boys will bring their pulsating melodies to 24 cities in the United States, Canada, and Mexico. Tennant, a former Marvel Comics editor who formed the Pet Shop Boys in 1981 with Lowe  then an architecture student  said this tour’s shows are completely different from those the band has done in the past. This excursion supports the Pet Shop Boys’ latest release, Fundamental, produced by the legendary Trevor Horn. Speaking via phone from London, Tennant lauds the Fundamental focus on stage production. ‘We have a tradition of doing theatrical shows. It’s fun. This is a multimedia, high-tech show, with a lot of video and film in it,’ he says. With the bulk of their hits coming out in the late 1980s and early 1990s, Tennant says audiences tend to expect something of a reunionlike performance. But the shows offer something for longtime Pet Shop Boys fans as well as younger listeners who weren’t around when the first string of singles made it big. Fundamental, the band’s ninth studio album and first since 2002’s Release, hit stores this past June. The new disc contains eleven original tracks by Tennant and Lowe, along with a Dianne Warren composition, ‘Numb.’ The record’s first single, ‘I’m with Stupid,’ became a Top 10 hit upon its release in Great Britain, and a second single, ‘Minimal,’ was released shortly thereafter.